This report covers intercepts concluded between January 1, 2015, and December 31, 2015, and provides supplementary information on arrests and convictions resulting from intercepts concluded in prior years. Forty-eight jurisdictions (the federal government, the District of Columbia, the Virgin Islands, Puerto Rico, and 44 states) currently have laws that authorize courts to issue orders permitting wire, oral, or electronic surveillance. Table 1 shows that a total of 28 jurisdictions reported using at least one of these types of surveillance as an investigative tool during 2015. The number of federal and state wiretaps reported in 2015 increased 17 percent from 2014. A total of 4,148 wiretaps were reported as authorized in 2015, with 1,403 authorized by federal judges and 2,745 authorized by state judges. Compared to the applications approved during 2014, the number approved by federal judges increased 10 percent in 2015, and the number approved by state judges increased 21 percent. No wiretap applications were reported as denied in 2015. In 27 states, a total of 124 separate local jurisdictions (including counties, cities, and judicial districts) reported wiretap applications for 2015. 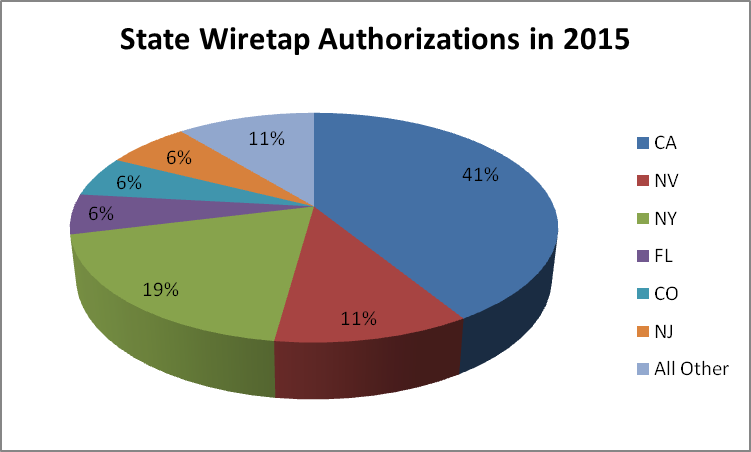 Applications concentrated in six states (California, New York, Nevada, New Jersey, Colorado, and Florida) accounted for 89 percent of all state wiretap applications. Applications in California alone constituted 41 percent of all applications approved by state judges. Seventy-nine federal jurisdictions submitted reports for 2015. For the second year in a row, the District of Arizona authorized the most federal wiretaps, approximately 8 percent of the applications approved by federal judges. Federal judges and state judges authorized 958 wiretaps and 411 wiretaps, respectively, for which the AO received no corresponding data from prosecuting officials. Wiretap Tables A-1 and B-1 (which will become available online after July 1, 2016, at http://www.uscourts.gov/statistics-reports/analysis-reports/wiretap-reports) contain information from all judge and prosecutor reports submitted for 2015. The entry “NP” (no prosecutor’s report) appears in these tables whenever a prosecutor’s report was not submitted. Some of the prosecutors’ reports were received too late to include in this document, and some prosecutors may have delayed filing reports to avoid jeopardizing ongoing investigations. Information about these wiretaps should appear in future reports. Table 2 presents the number of intercept orders issued in each jurisdiction that provided reports, the number of extensions granted, the average lengths of the original periods authorized and any extensions, the total number of days in operation, and the locations of the communications intercepted. Federal and state laws limit the period of surveillance under an original order to 30 days.1 This period, however, can be lengthened by one or more extensions if the authorizing judge determines that additional time is justified. During 2015, the average length of an original authorization was 30 days, the same as in 2014. The average length of an extension was also 30 days. In total, 3,297 extensions were requested and authorized in 2015, an increase of 115 percent from the prior year. The District of South Carolina and the Northern District of Illinois conducted the longest federal intercepts that were terminated in 2015. An original order in the District of South Carolina was extended nine times to complete a 300-day wiretap used in a narcotics investigation. In the Northern District of Illinois, an order was extended eight times to complete a 263-day wiretap in a bribery investigation. For state intercepts terminated in 2015, the longest intercept occurred in Queens County, New York, where the original order was extended 30 times to complete a 913-day wiretap used in a racketeering investigation. The most frequently noted location in wiretap applications was “portable device.” This category includes cell phone communications, text messages, and application software (apps). In 2015, a total of 96 percent (3,969 wiretaps) of all authorized wiretaps were designated as portable devices. Prosecutors, under certain conditions, including a showing of probable cause to believe that actions taken by a party being investigated could have the effect of thwarting interception from a specified facility, may use “roving” wiretaps to target specific persons by using electronic devices at multiple locations rather than at a specific telephone or location (see 18 U.S.C. § 2518(11)). In 2015, a total of 54 federal and state wiretaps were designated as roving. Drug offenses were the most prevalent type of criminal offense investigated using wiretaps. Table 3 indicates that 79 percent of all applications for intercepts (3,292 wiretaps) in 2015 cited illegal drugs as the most serious offense under investigation, compared to 89 percent in 2014. Homicide, the second-most frequently cited crime, was specified in 5 percent of applications. Conspiracy was the third-largest category and was specified as the most serious offense in approximately 5 percent of applications. Many applications for court orders revealed that multiple criminal offenses were under investigation, but Table 3 includes only the most serious criminal offense listed on an application. In 2015, for reported intercepts, installed wiretaps were in operation for an average of 43 days, 9 days above the average in 2014. The federal wiretap with the most intercepts occurred during a narcotics investigation in the District of South Carolina and resulted in the interception of 81,122 messages over 300 days, including 35,402 incriminating interceptions. The state wiretap with the most intercepts was a 120-day wiretap for a narcotics investigation in Maricopa County, Arizona, which resulted in the interception of 412,298 cell phone conversations, of which 15,566 were incriminating. The number of state wiretaps in which encryption was encountered decreased from 22 in 2014 to 7 in 2015. In all of these wiretaps, officials were unable to decipher the plain text of the messages. Six federal wiretaps were reported as being encrypted in 2015, of which four could not be decrypted. Encryption was also reported for one federal wiretap that was conducted during a previous year, but reported to the AO for the first time in 2015. Officials were not able to decipher the plain text of the communications in that intercept. Table 5 provides a summary of expenses related to wiretaps in 2015. The expenditures noted reflect the cost of installing intercept devices and monitoring communications for the 2,479 authorizations for which reports included cost data. The average cost of an intercept in 2015 was $42,216, up 7 percent from the average cost in 2014. The most expensive state wiretap was in Rockland County, New York, where costs for a 390-day narcotics wiretap resulting in 36 arrests and 18 convictions totaled $1,363,192. For federal wiretaps for which expenses were reported in 2015, the average cost was $48,892, a 9 percent increase from 2014. The most expensive federal wiretap completed during 2015 occurred in the District of Connecticut, where costs for a conspiracy investigation that included five other wiretaps totaled $884,769. The three major categories of surveillance are wire, oral, and electronic communications. Table 6 presents the type of surveillance method used for each intercept installed. The most common method reported was wire surveillance that used a telephone (land line, cellular, cordless, or mobile). Telephone wiretaps accounted for 94 percent (2,578 cases) of the intercepts installed in 2015, the majority of them involving cellular telephones. Data on individuals arrested and convicted as a result of interceptions reported as terminated are presented in Table 6. As of December 31, 2015, a total of 4,448 persons had been arrested (up 26 percent from 2014), and 590 persons had been convicted (up 7 percent from 2014). Federal wiretaps were responsible for 29 percent of the arrests and 19 percent of the convictions arising from wiretaps for this period. The Eastern District of Virginia reported the most arrests and convictions for a federal district in 2015, resulting in the arrest of 201 individuals and conviction of 51 individuals. At the state level, Riverside County, California, reported the largest number of total arrests (315), followed by the 10th Judicial Circuit in Florida (286). New York, New York, had the highest number of total convictions (85) for any state jurisdiction in 2015. Table 7 presents data on intercepts reported each year from 2005 to 2015. Authorized intercept applications reported by year increased 96 percent from 2,121 in 2005 to 4,148 in 2015 (the total for 2005 was revised after initial publication). The majority of wiretaps have consistently been used for narcotics investigations, which accounted for 81 percent of intercepts initially reported in 2005 (1,433 applications) and 81 percent in 2015 (3,367 applications). Table 9 presents the total number of arrests and convictions resulting from intercepts terminated in calendar years 2005 through 2015. Under 18 U.S.C. § 2519(2), prosecuting officials must file supplementary reports on additional court or police activity occurring as a result of intercepts reported in prior years. Because many wiretap orders are related to large-scale criminal investigations that cross county and state boundaries, supplemental reports are necessary to fulfill reporting requirements. Arrests, trials, and convictions resulting from these interceptions often do not occur within the same year in which the intercepts were first reported. Table 8 shows that a total of 8,475 arrests, 4,751 convictions, and additional costs of $121,869,918 arose from and were reported for wiretaps completed in previous years. Forty percent of the supplemental reports of additional activity in 2015 involved wiretaps terminated in 2014. Interceptions concluded in 2014 led to 31 percent of arrests, 24 percent of convictions, and 34 percent of expenditures noted in the supplementary reports. 1 See 18 U.S.C. § 2518(5).